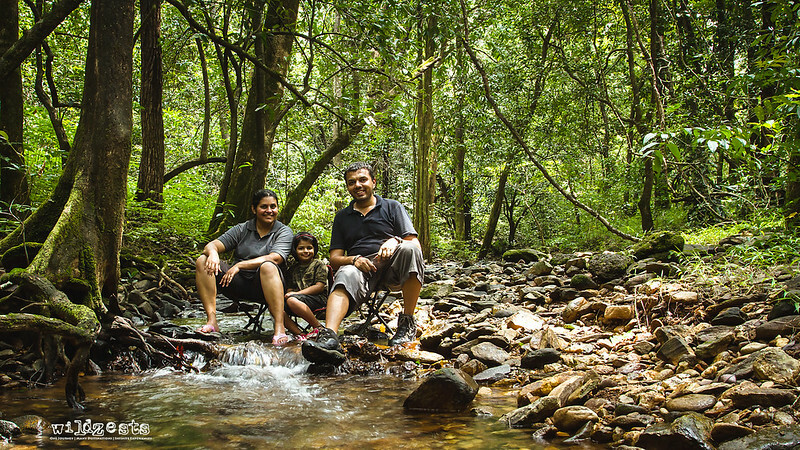 The weekend after Pozu's birthday was going to be at one of favorite Jungle Lodges in Bandipur. Gowri's cub Prince was being sighted quite often in the tourism zone and we were hopeful of catching a glimpse of the young male tiger ruling the area that once his mother reigned upon. 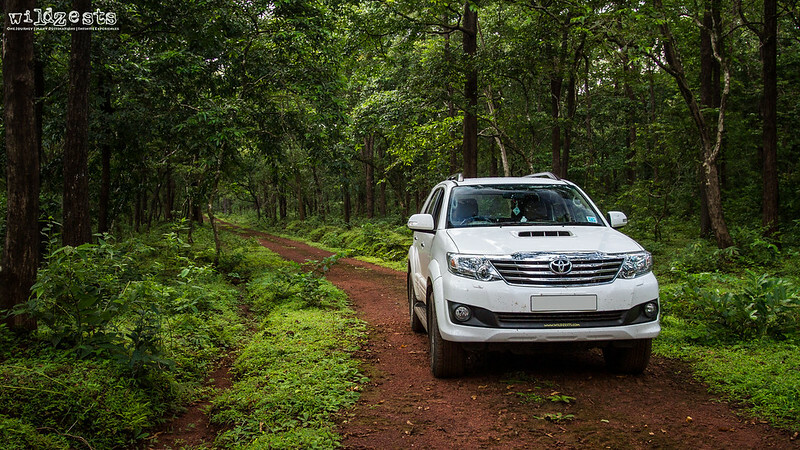 An early morning start ensured that we were able to do a customary stop at the Ranganathittu Bird Sanctuary. The migratory birds had yet to arrive and so we just decided to do a short boat ride and let the kids enjoy watching the crocodiles. 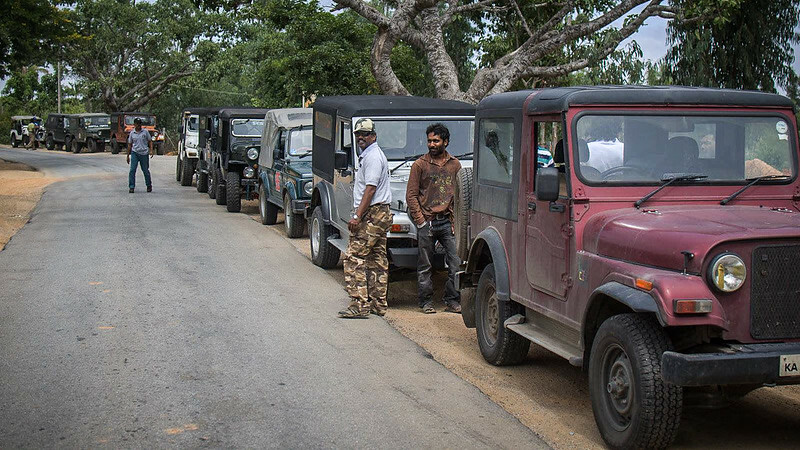 We reached Bandipur in time for lunch and got ready for our first safari in the afternoon. The weather was pleasant and the light was good, both conditions hinted towards poor sightings in the forest. 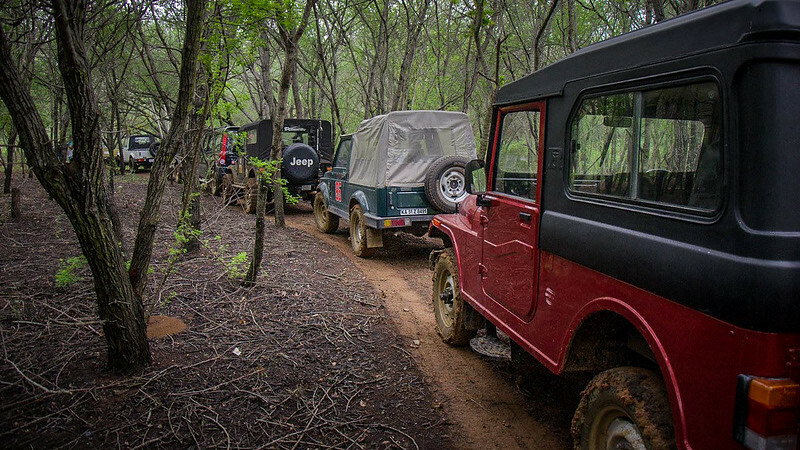 And that's exactly what happened as well, the forest was nice and quiet and although one of the vehicles saw a glimpse of a leopard, the big cats remained pretty much elusive. 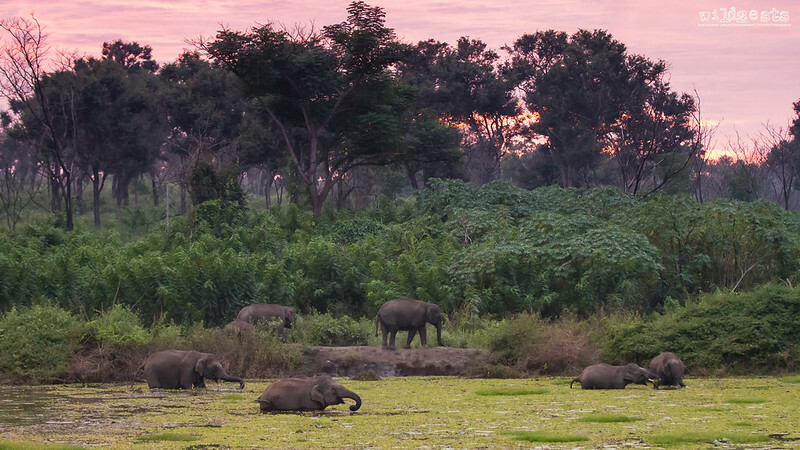 But we did have some good time watching a herd of elephants taking a dip in the pond as the sun was about to set in the background. Although this wasn't the best setup from a photography standpoint, it was an awesome experience just to witness how the jumbos helped each other down the steep incline of the pond and were enjoying in the water. 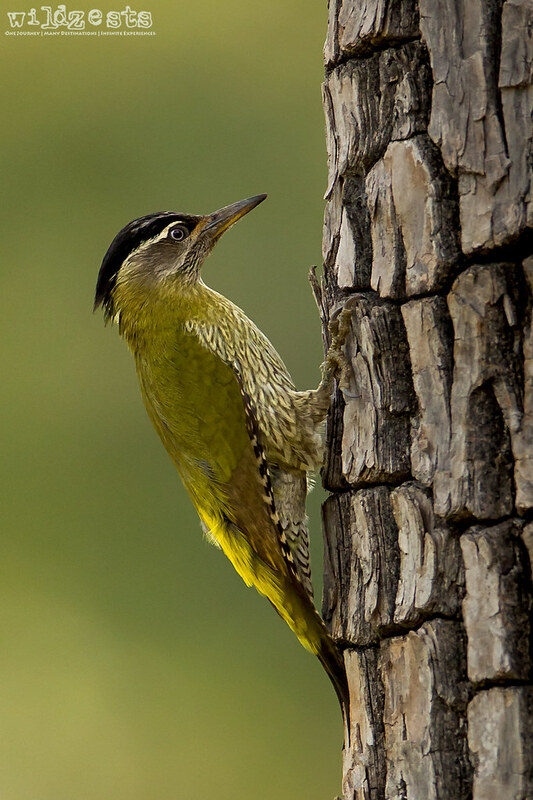 This lady streak-throated woodpecker gave us some nice opportunities to shoot with a clean green background. 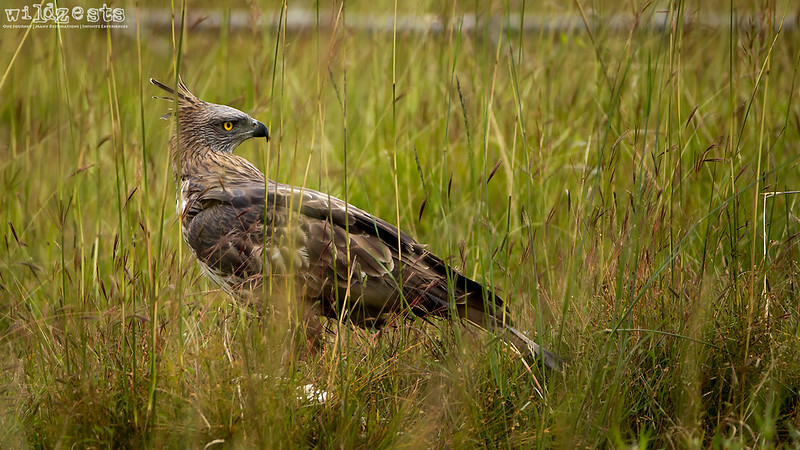 Next day morning we spotted a Changeable Hawk Eagle sitting in between tall grass and we were wondering why it was sitting down there. Just then it flew with a Pond Heron clenched in its talons and perched on a branch far away from the track. What followed was a series of feather tearing action to start feeding on the flesh. 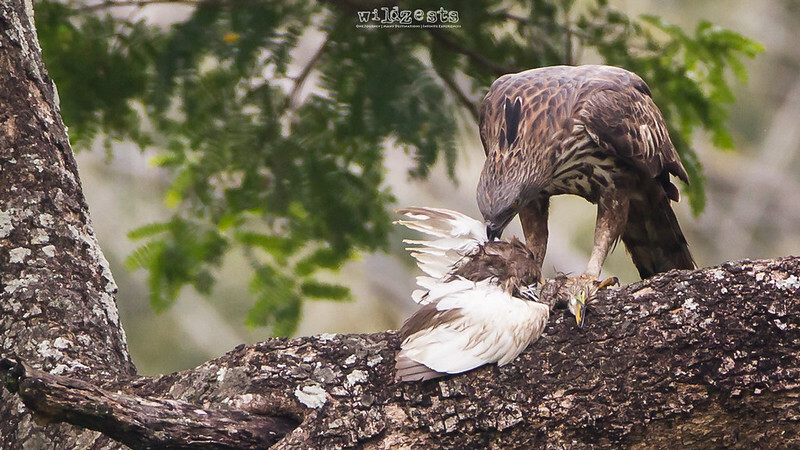 I am sure this was just a snack for the huge raptor who are known to hunt smaller monkeys as well. 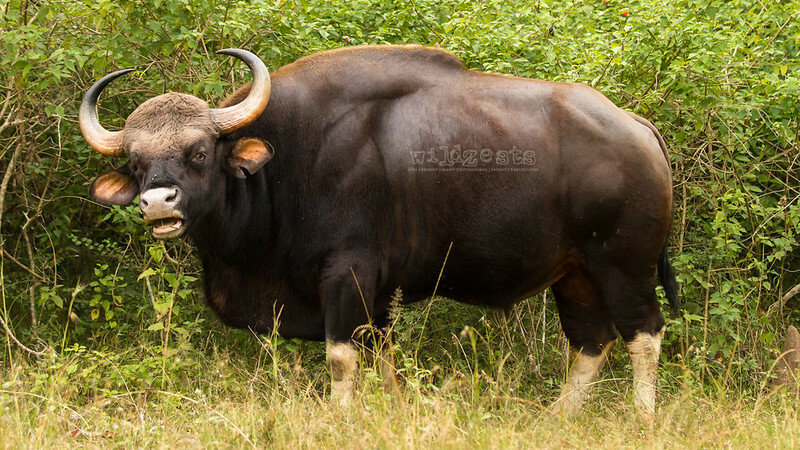 A huge alpha males gaur leading the herd that was grazing besides the track was an awesome sight to watch as well. Although they're usually pretty calm and avoid proximity to the jeeps, there have been few reports of aggressive behaviors by these largest wild cattle. Weighing more than a tonne at times, these males can be a serious threat if provoked. Overall, it was a good trip and more so because I hadn't been to Bandipur in quite a while and it was just nice to be there. Our luck with the big cats didn't really work out this time, but that's a part of these wildlife trips, you shouldn't read too much into that anyway. As a kid, I used to feel that time goes so slow and it'd be good if we could get a time machine to become older quickly. Now, as a parent, I feel that Pozu's growing up at so fast that we need some way to slow things down and enjoy her naughty childhood a little more. I'm sure she wouldn't be happy if I told her that! 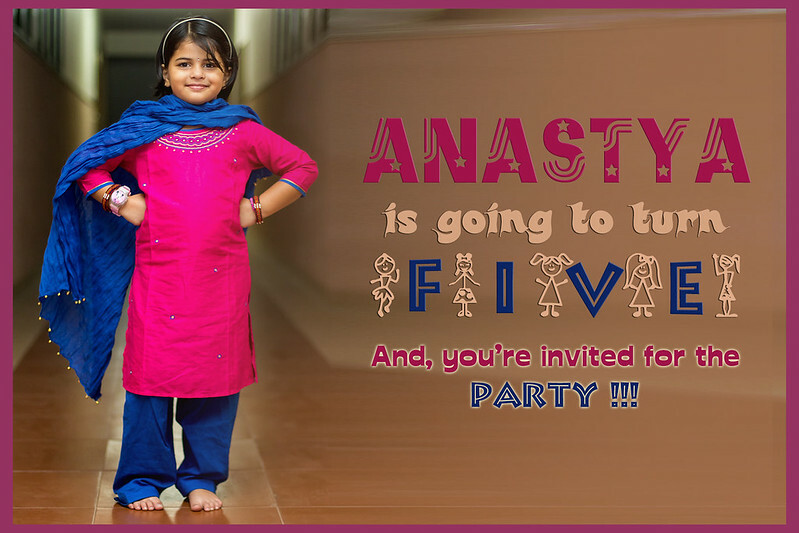 She turned five last week and this time her birthday party was very different than all the earlier years. For a start, she now knows what to expect on a birthday party and could tell us what she'd like to do for her party. It was our first real birthday party for the kids, all the earlier ones were all focused on adults and it used to be a get together for our friends more than hers. Also, this time Gozu was quite keen on doing it at the clubhouse rather than at home so that there's enough place for the kids to monkey around (it turned out to be a very good idea). The only thing that I hadn't anticipated was the amount of work that was needed to organize the event, and that meant that I was running around until the party started. But in the end it was all worth the effort. 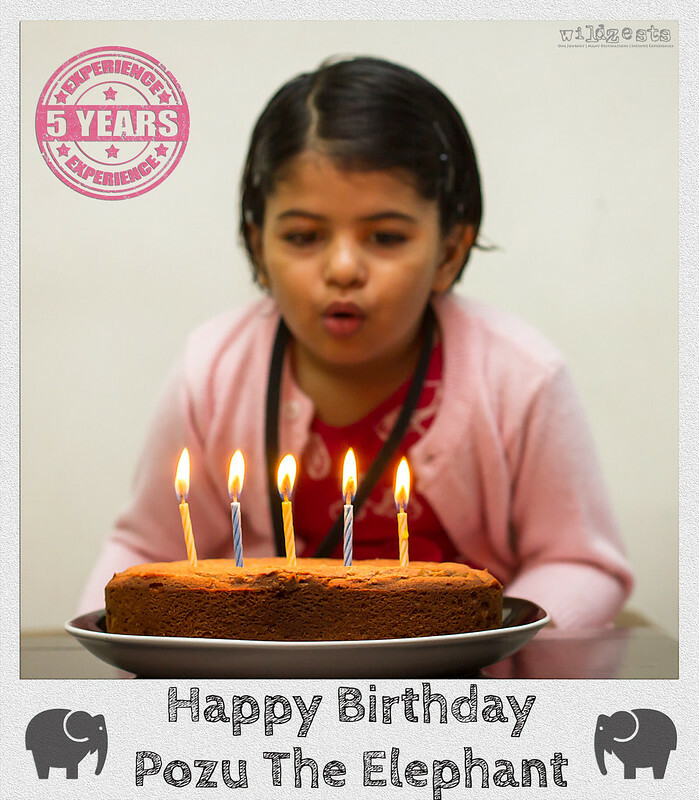 Gozu had baked a special cake for her which she cut as the first birthday cake of the day before going to school. She was so excited about celebrating her birthday with friends in school that she distributed all her chocolates right in the school bus and later realized that she didn't have any left for her classmates. Poor thing, I should have given her the spare packet of chocolates that was kept at home. Note to self - next time, give her more than double of what's required for the bus and her class! Pozu had given me a list of some 20+ friends she wanted to invite for her birthday and surprisingly we had more than 80% of the kiddies turn up for the party. The fun started right at 6PM as kids started coming in and soon the whole place had transformed into a madhouse with the birthday trumpets. Gozu and Shalu had arranged for some games for the kids and that kept them happily busy for a while until it was time to cut the cake. Pozu had specified that she wanted to have an elephant cake - in line with her "I'm Pozu - the elephant" statement. Some of her friends wanted to smash some cake on her face, but that led to some loud crying and that mission was aborted. After the cake cutting, the kids knew that it was time for the party to get over. That marked the beginning of the destruction and all the kids got busy in taking down the balloons and the decoration. This was a new revelation for me since I hadn't seen this stage of the birthday party before. But in the end everyone went home with a happy and smiling face, that's what matters! 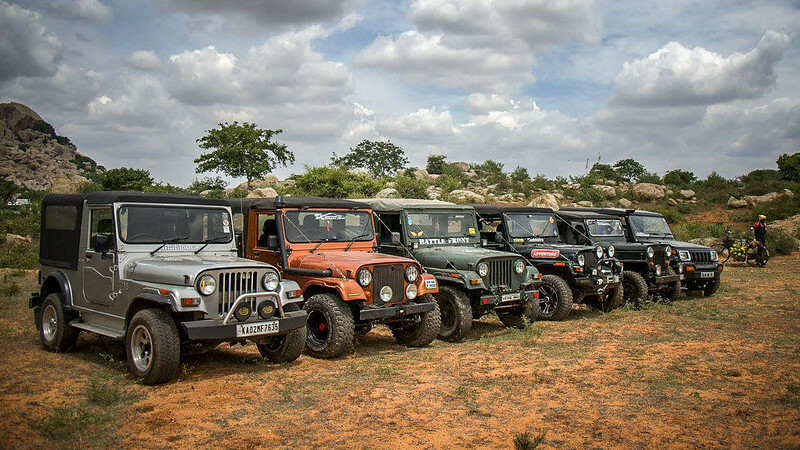 The JeepThrills team had planned a day event at the Bidaraguppe lake near Sarjapur. 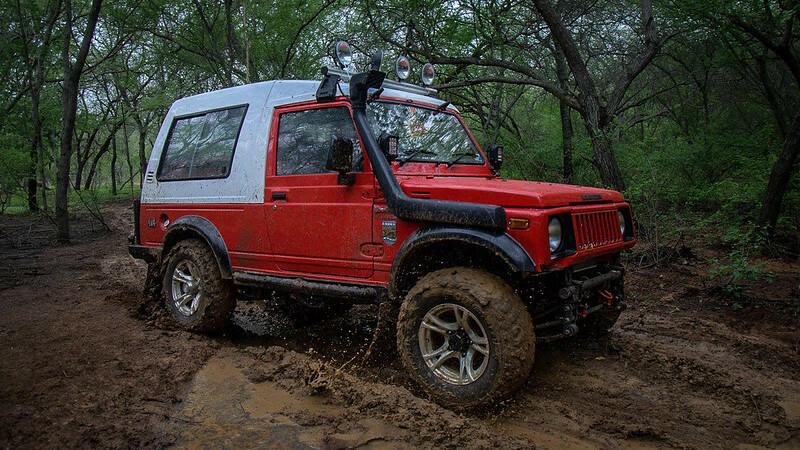 The lake bed presents quite a challenging obstacle course for the 4x4s while the risk of breakage is relatively lower since it's all mud. This time around it was a smaller group with about 7-8 vehicles with a healthy mix of Jeeps and Gypsies. 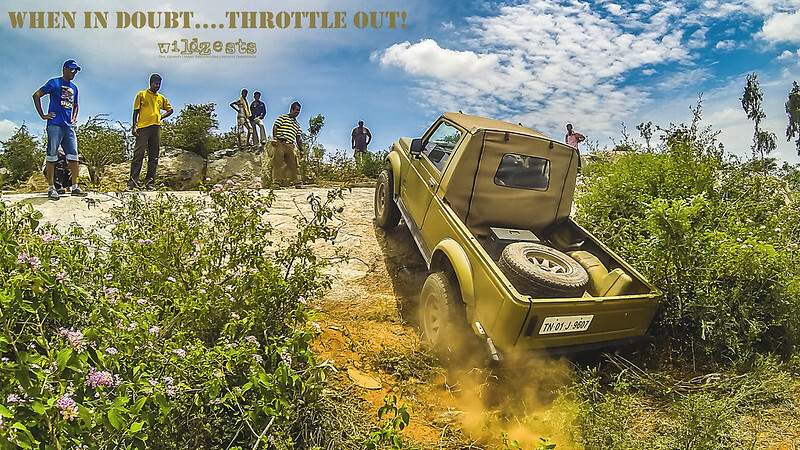 I had done a similar OTR in 2013 and you can read up on it here (Sunday Morning OTR - Bidaraguppe Lake). However, if you look at the picture above, the last time we came here, it was summer and everything was dry. But this time it was very different. The whole place had transformed into a green shrub forest with slushy tracks all around. 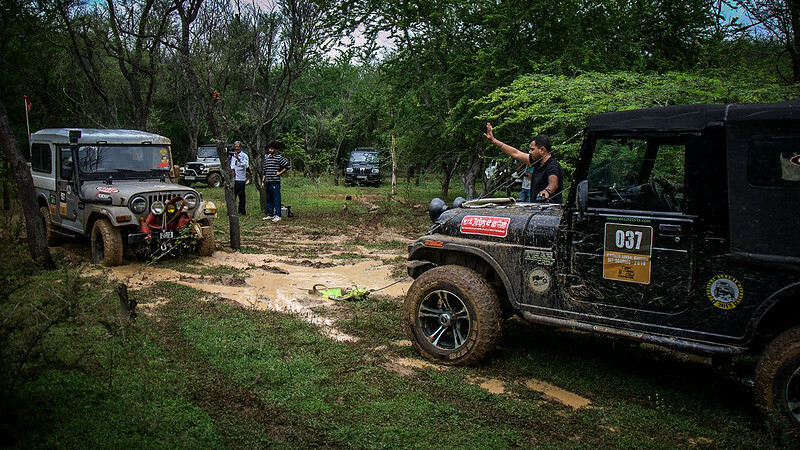 There were small water bodies all across and we had a good time with this one where it was only a few gypsies that made it through with their high revving engines and light weight bodies. 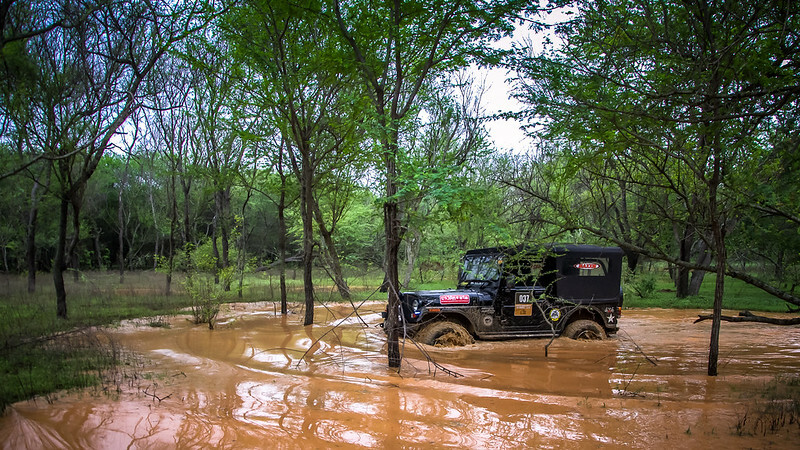 All the jeeps just sank in the mud at the exit, including mine! 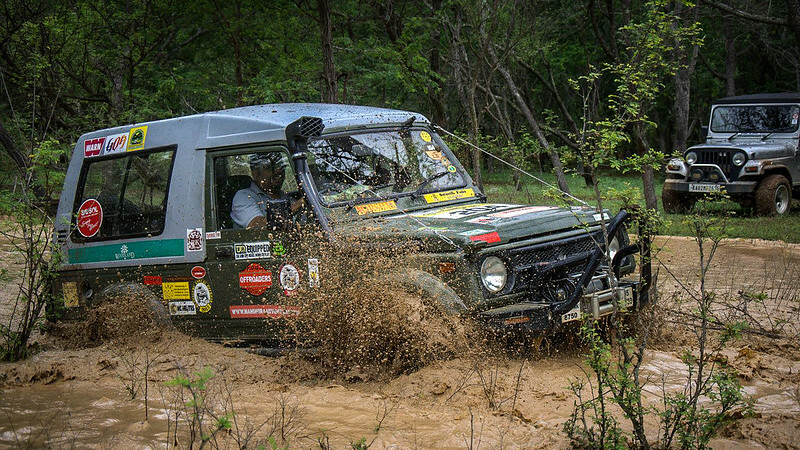 There was a lot of recovery that had to happen and the winch came in good use. 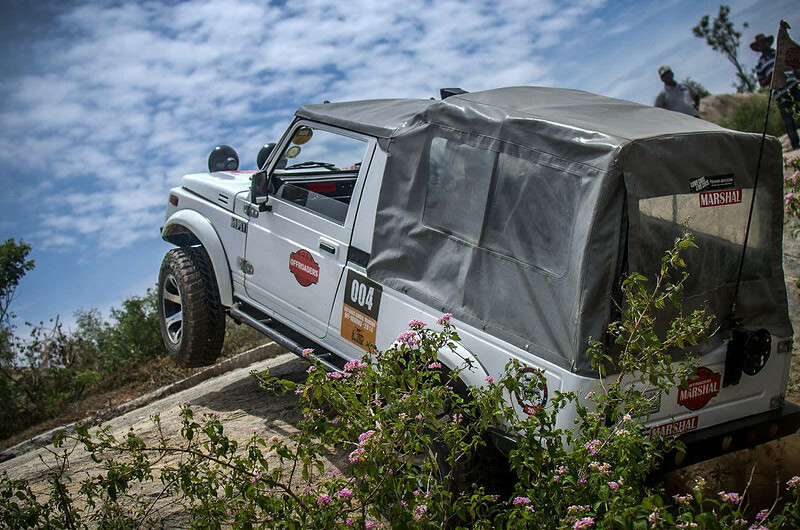 The next obstacle was a climb through a slushy incline and this is where the Jeeps could do it more easily than the Gypsies because of the low range torque. The gypsies needed to be revved hard and taken through without losing momentum and that means there's a lot more tossing around that happens as compared to the jeeps. Overall it was quite a fun day with a challenging trail and a lot of recoveries. Good thing was that there were no breakdowns and everyone made home safely. The weather too was cloudy and cool all through the afternoon which made it a pleasure to be outdoors. PS: Unfortunately, I hadn't carried my camera for this event so all I got was some phone camera pics. All images used in this post are shot by Caleb Shireesh Jacobs and are reproduced/reprocessed with his permission. This year the Dasara holiday and Gandhi Jayanti were two events that most of us were eagerly waiting for. It opened up a lot of possibilities for travel with a 4 day weekend and more interestingly a 9-day vacation with just 3 days of leave. Pozu had a week long vacation from school that week anyway. As the days approached, we realized that we hadn't taken a big vacation in this whole year and it may be good if we just take the whole week off and be at home even if we don't end up going anywhere. Being a super long weekend, almost everything had already either been booked or was turning out to be a super expensive affair. Moreover, we were certain to find hordes of people anywhere we land up and that's something that I usually don't like. We prefer to visit places where we simply don't see too many people. Although I must call out that in India, it's all in relative terms coz there are people just about everywhere. And the other agenda is usually to find a place with some wildlife so I could sit around a practice some photography as well. 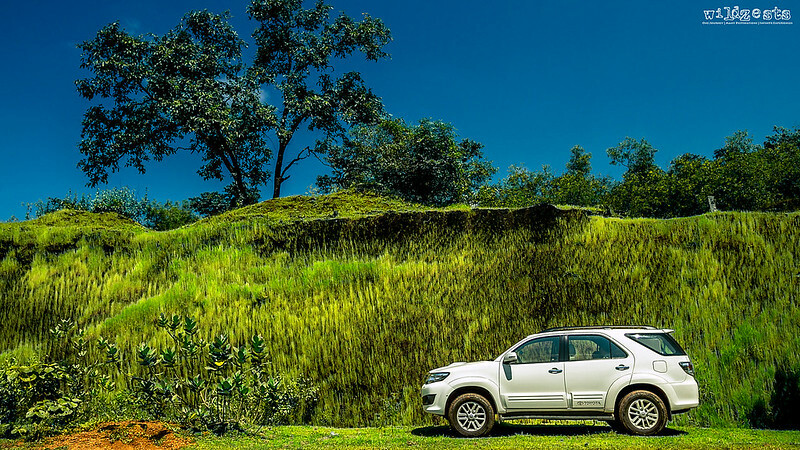 After reviewing all available options from the hill stations of Ooty and Coonoor, to the beaches of Goa, we still hadn't zeroed down on a place. 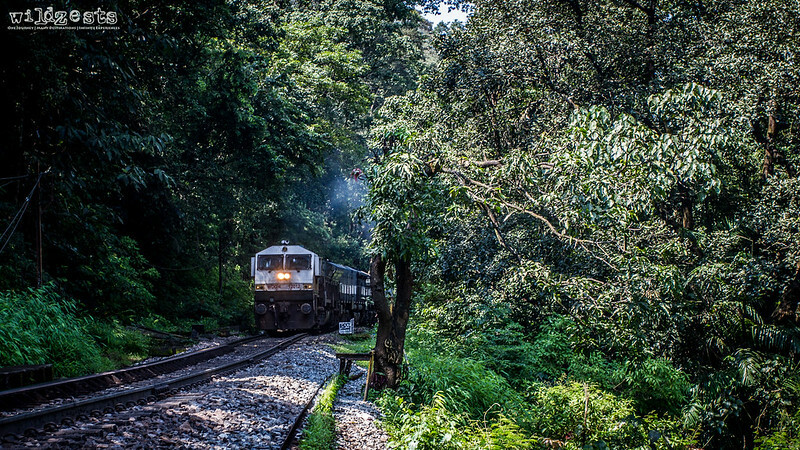 Finally, after a lot of discussions it was either going to be some remote places around Sakleshpur and/or Coorg or a trip to the unseen forests of Goa mainly with a birding agenda. We still weren't sure about the accommodation and food etc since there were no bookings made. But that's the good part about our trips, we like to go places where we don't know what's in store for us. 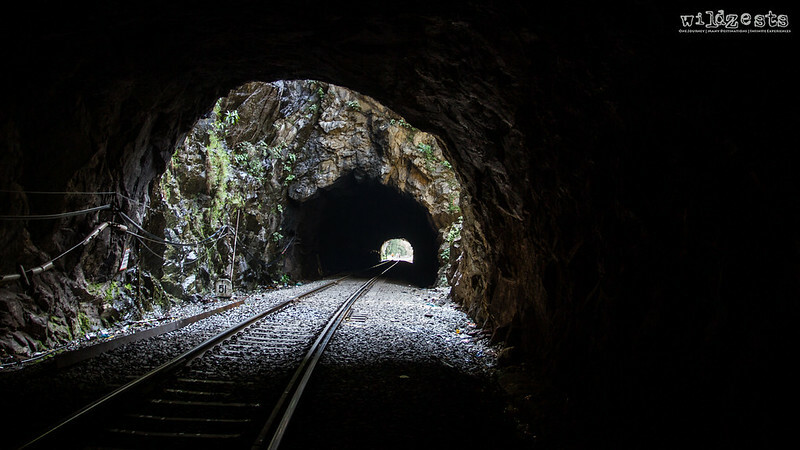 We've figured that in the end, everything can either turn out to be okay or go horribly wrong, but in any case, these experiences create long lasting memories from such trips and help you become a better traveler. Not being able to decide which place to go, we just packed our bags and loaded the car. It was now left to fate to decide where we end up eventually. Pozu was all charged up with the idea that we were going out, a darling that she is, she didn't care what place. For her anyplace that's not home and has place to play around is good. 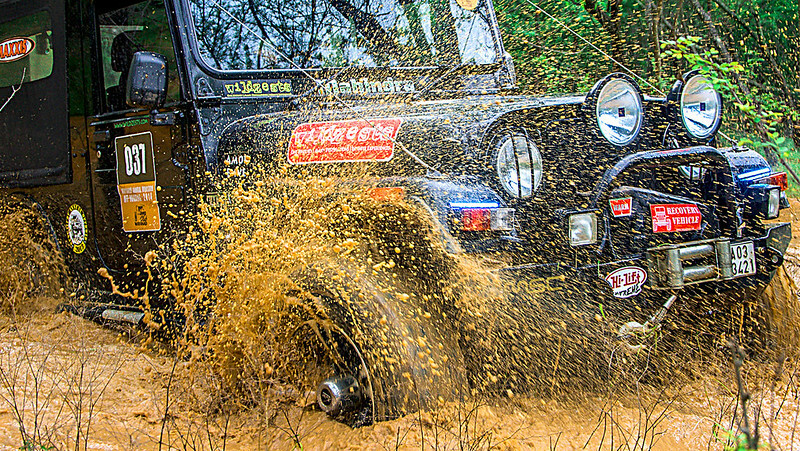 We left around 3AM as usual and soon we were out of the city and cruising on the NH4. Before we realized, we had already overshot the turn to Sakleshpur. Whether it was good or bad I don't know, but it meant one thing for sure. 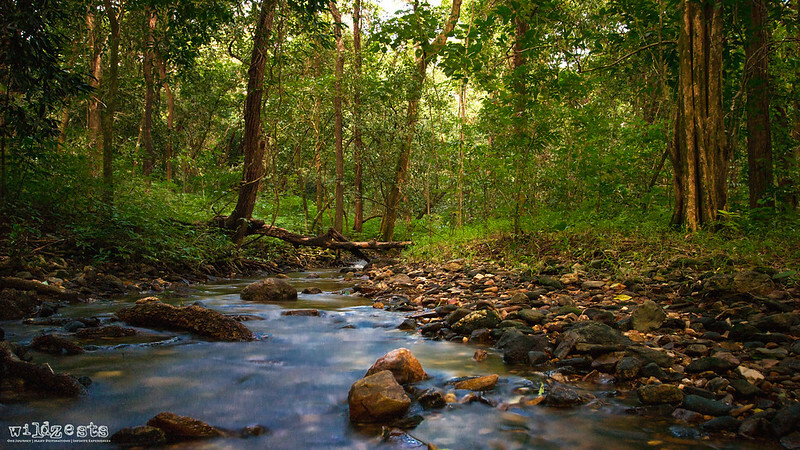 Our destination was now finalized, we were headed to the forests of Goa! 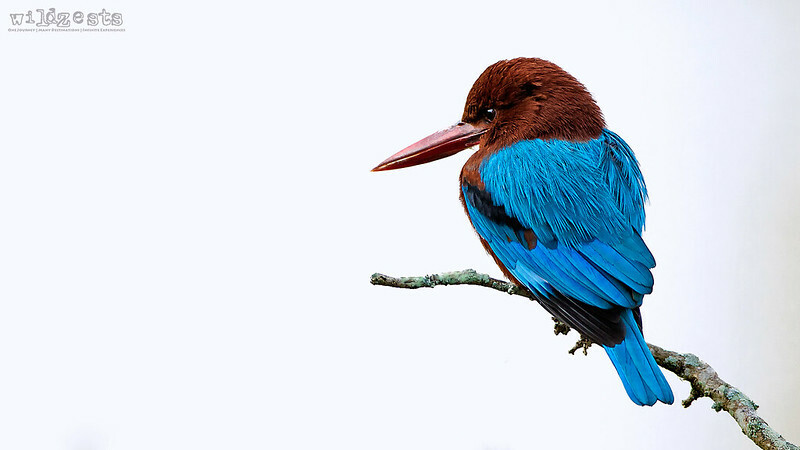 Now it was still early October and the birding season was yet to begin, but I was hopeful that the Bhagwan Mahaveer Sanctuary and the Zuari river would be enough to keep me partially busy at least. 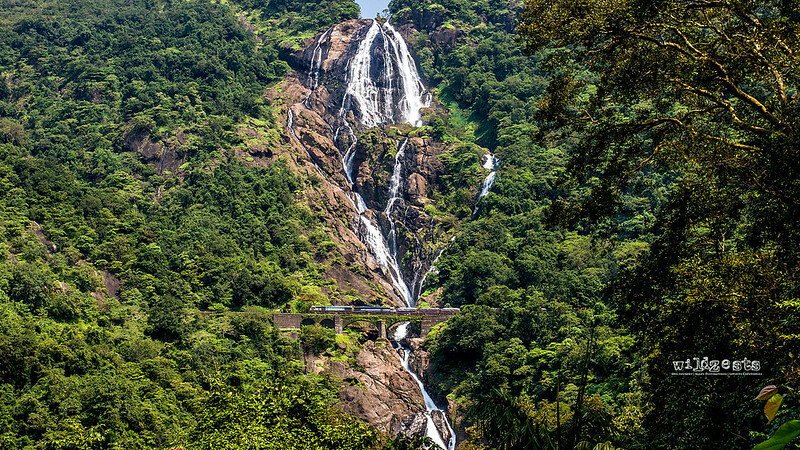 The plan was to find a stay near Mollem so we could visit the sanctuary and do a trip to Dudhsagar falls. 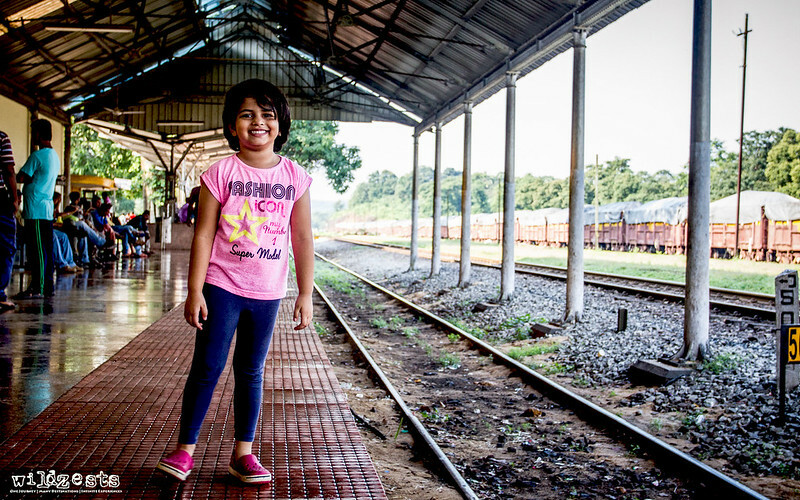 So, instead of taking the Hubli-Karwar route, we took the Dharwad-Londa-Ponda route to get to Mollem. 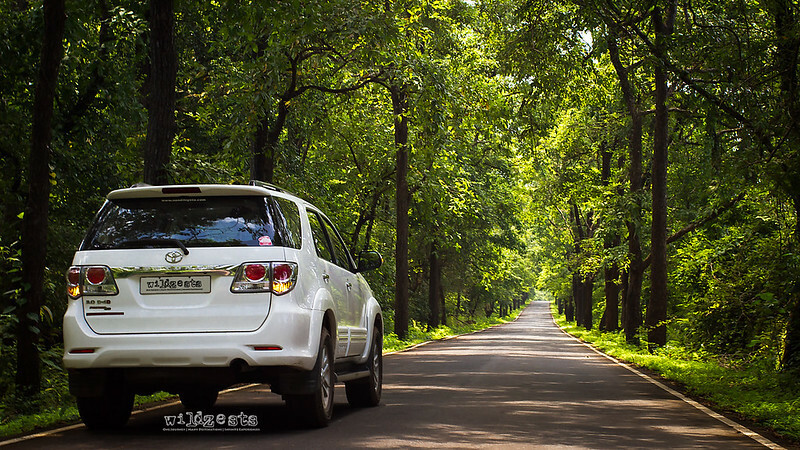 Previously when I had taken this route, the roads from Dharwad till Londa were in really bad shape, but this time I was surprised to see that the roads till the Karnataka exit were actually pretty good. 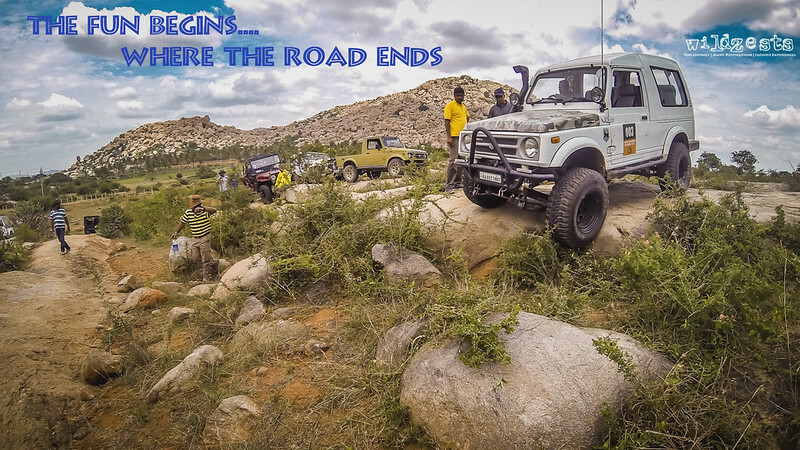 However, the road after Londa is where it starts getting rougher so much that it becomes difficult to distinguish between the road and the potholes in some places. 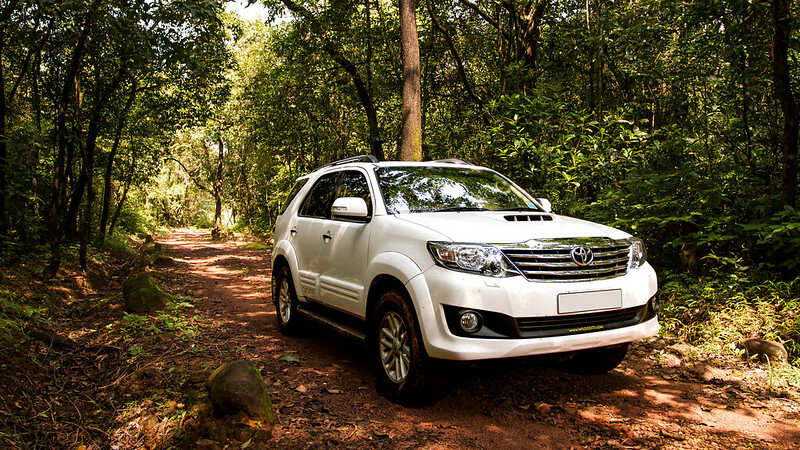 The Fortuner took all of it in its stride, although I couldn't help commenting that our Safari would have done the stretch at 20% higher speeds without any discomfort inside the cabin. 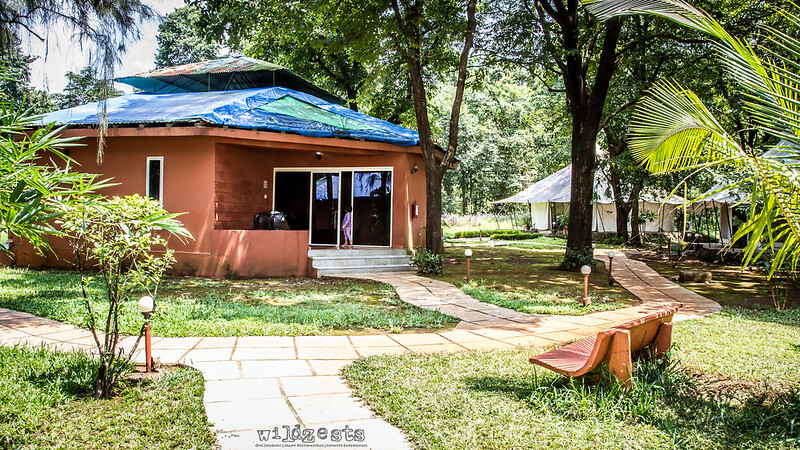 It was still Sunday morning when we reached Mollem where we found the Dudhsagar Spa Resort right next to the gate for the sanctuary, barely a 7 hour drive from home. Now, I had other things in mind when it came to our stay options, it had to be minimalistic in order to keep the costs down. However, when you're traveling with family, it's always good to make subtle compromises in order to keep them happy else my photography life will become really tough. Both Gozu and Pozu had already pictured themselves having fun at a place like that with nice lawns and children's play area etc. So I went in and enquired about availability, good news was it was available but bad news was it was not in my desired budget. A round of negotiations helped finalize a deal that was reasonable and we were settled. We had secured bookings for the next 4 days until the mad rush begins from Thursday onwards when we were planning to head back and enjoy the long weekend at home while everyone's out. Over the next 3 days we spent a lot of time inside the sanctuary, just sitting around in the forest and enjoying the absolute quietness. 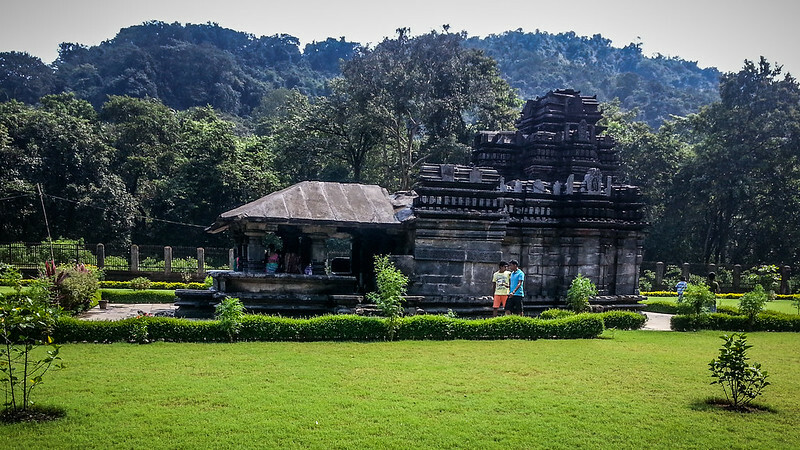 We also visited the Tambdi Surla temple, the Bondla wildlife sanctuary, Salim Ali Bird sanctuary etc. All my birding plans had to be shelved since most of the activities had not started yet and some places needed a long trek which wasn't possible with the two ladies along. But I wasn't complaining, being in the wilderness was good enough. Best part was, there were no people around at all, not a single soul to be seen for hours together. Option 2 and 3 were out of question with Pozu along with us. So it had to be the train, and Thursday was the only day we could get a train that will take us in the morning and bring us back to Kulem at around lunch time. Overall, it was a nice trip, although it was a very hot day and a little bit of rain would have really helped. I was happy that I managed to capture the beautiful falls along with a train on the bridge, so mentally that one thing was off my checklist. The return train was a bit delayed and it was almost 2.30PM by the time we were back at Kulem. The trip to Dudhsagar was the official end of our trip plan and we were supposed to be heading back home. But fate had other things in mind. On Wednesday, our gang of friends from Bangalore announced that they are coming to Goa with their families and asked us to stay back. 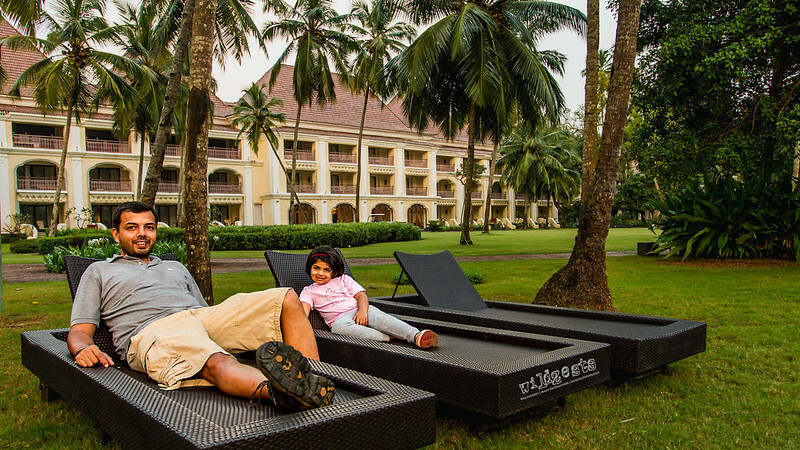 The only issue was that they were going to reach only on Friday morning while we had to checkout on Thursday from Dudhsagar Spa Resort. 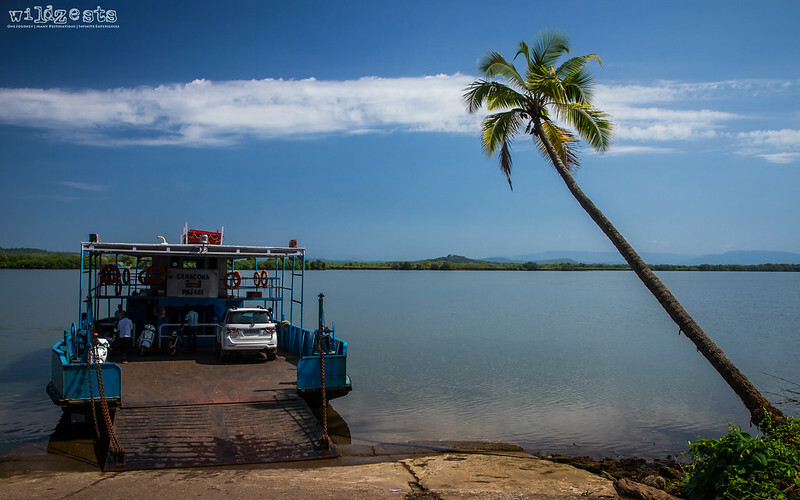 There were no bookings available for the following day, not at Dudhsagar and not anywhere else in Goa as well. 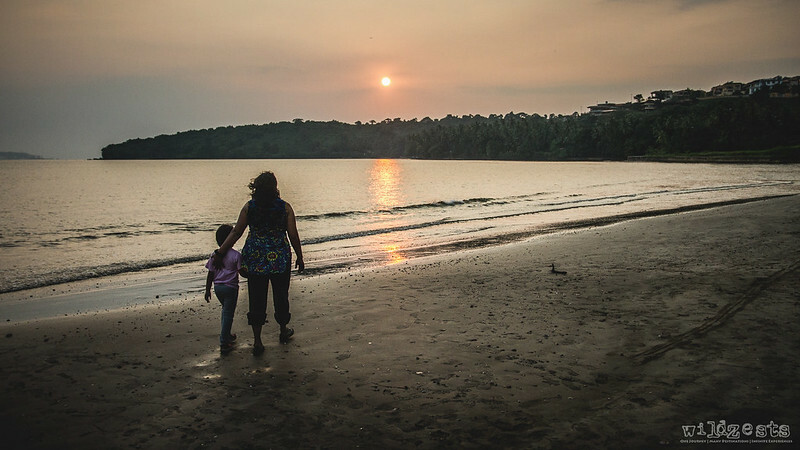 It looked like more than half of Bangalore and Mumbai/Pune was in Goa for that weekend. From the smallest of places to the 5-star resorts, every place I called, I got the same response, "Sorry Sir, we're fully booked until Sunday!" I was pretty sure that we'd find something or the other if we just landed up at places rather than searching on the internet. Just then, I managed to find one lucky room at the Grand Hyatt that may have opened up due to a cancellation. Now, this was absolutely not in our plan or budget, but then we didn't really have a plan to begin with. So from a moment ago where we were wondering what kind of place we'd get to stay, we had landed ourselves with one of our most luxurious and comfortable stays of the trip. The Grand Hyatt is a really big and beautiful property, no doubt on that. But never ever have I seen a 5-star property as crowded as it was on that day. The swimming pool was filled with people, there were people walking in the gardens, even the breakfast place was full on the next day morning. It just wasn't quiet anywhere unlike our stay at Dudhsagar. 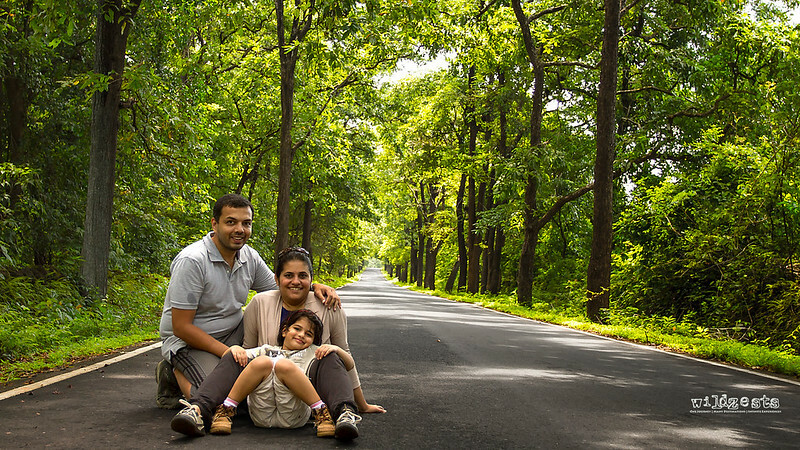 The good thing was that since we were now closer to the city, we got a chance to spend the evening with our friends Anil and Deepa while Pozu was super excited to see her friends Aarna and Ayira. 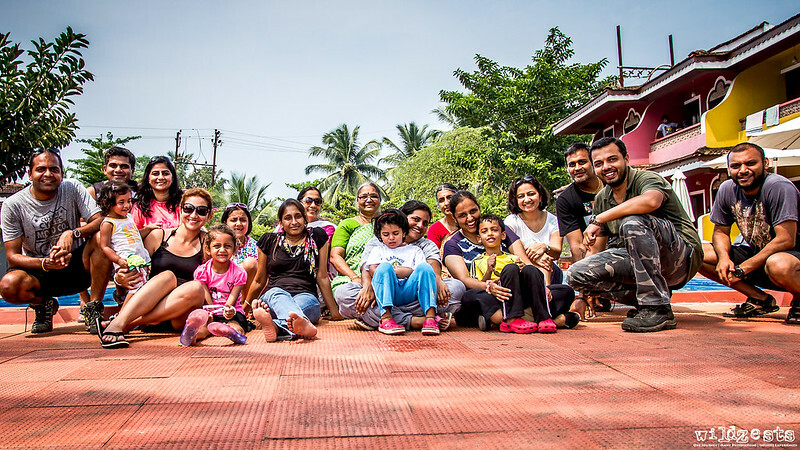 For the next two days, we were joining our crazy group of friends for a nice and comfortable stay at the Skylark resort in Colva. Luckily enough, we somehow managed to secure 7 rooms as a last minute booking, all thanks to the group that had cancelled out. The resort was quite good and food was equally amazing, most importantly, they had a nice big pool for us to have fun. Time just flies when you're having a good time, it was already Sunday before we knew. It was time to head back home, and this time it was for real! What happened after that, I'm sure nobody's really interested in. It was Monday! 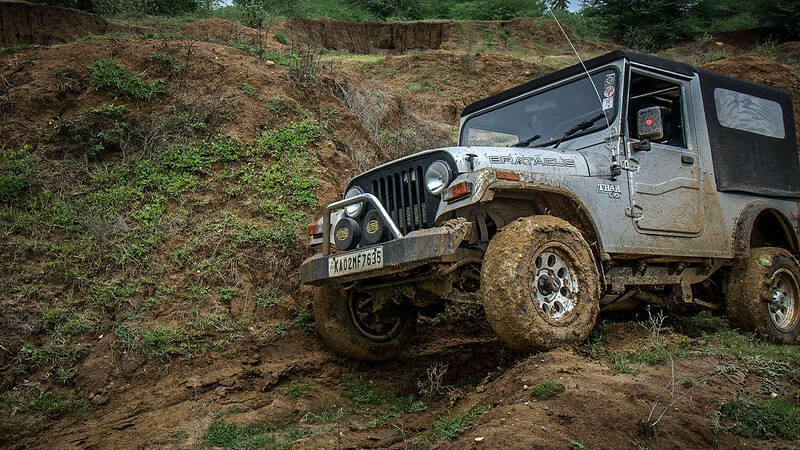 It was around mid-September and there was a half day event organized by the Jeep Thrills group. 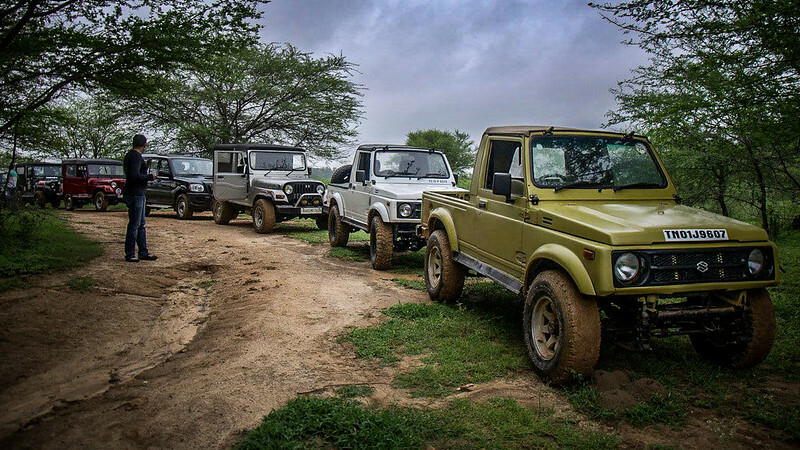 Now, I'd never say no for an offroad get together and the half day events are the most non-disruptive events from a weekend perspective. The only thing I have to take care is to get home before evening and take the two lovely ladies out. Unlike most of the other events, the meeting spot for this one was quite close by for me since we were all meeting up at Marathahalli bridge and then heading towards Hoskote. 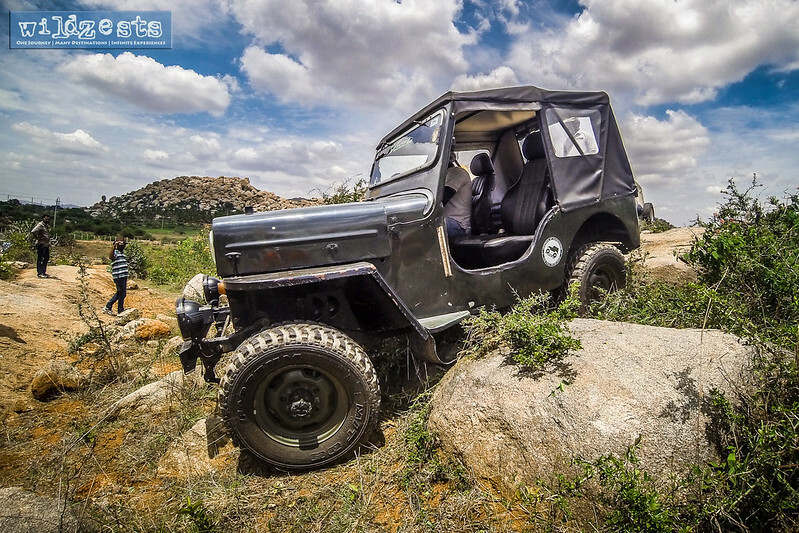 The spot we finally found was beyond Hoskote, somewhere near Tekal. The only issue was that it was almost past 11.30 by the time we started the trail and that meant I had to wrap up early to get back home and avoid trouble. 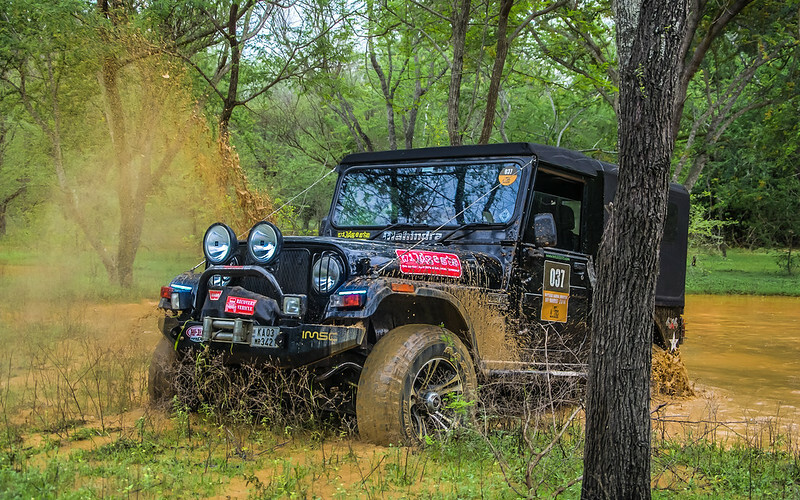 The terrain was all rocks and that meant that I had to make sure there's no underbody damage at the end of the event. The first obstacle was a nice 4ft climb on a boulder that was nearly vertical. There was a small ramp at the bottom that assisted the launch, but post that it was only about holding your nerves and not letting go of the throttle until you are on top. 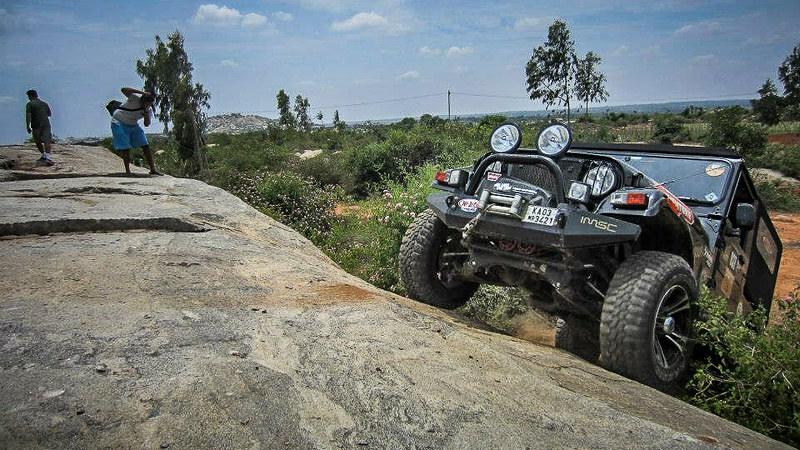 Once at the top, there was just enough place for a jeep before hitting the rocks at the front so one had to be careful not to roll it forward once the climbing was done. 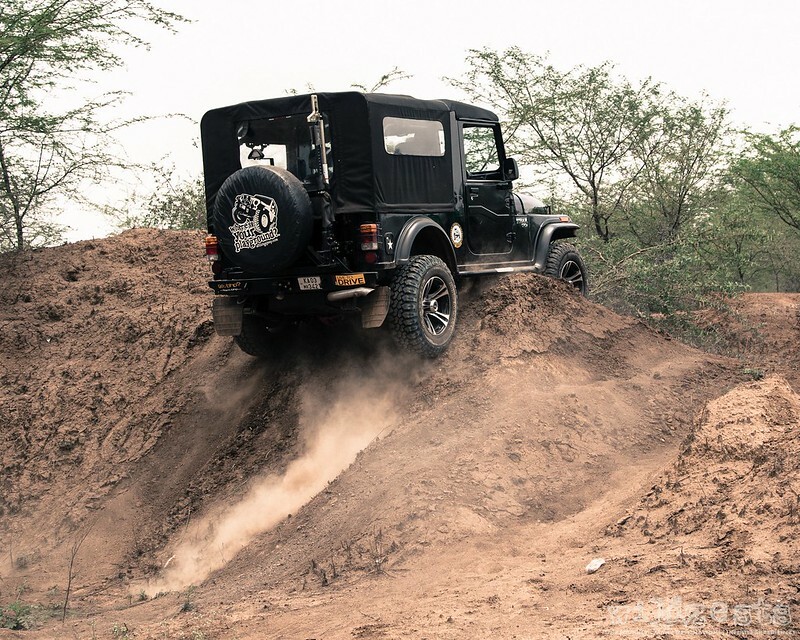 The gypsies are always the more dramatic ones in such obstacles since they can only climb with a good amount of throttle to build the torque, unlike the jeeps which can crawl up at fairly slower speeds. 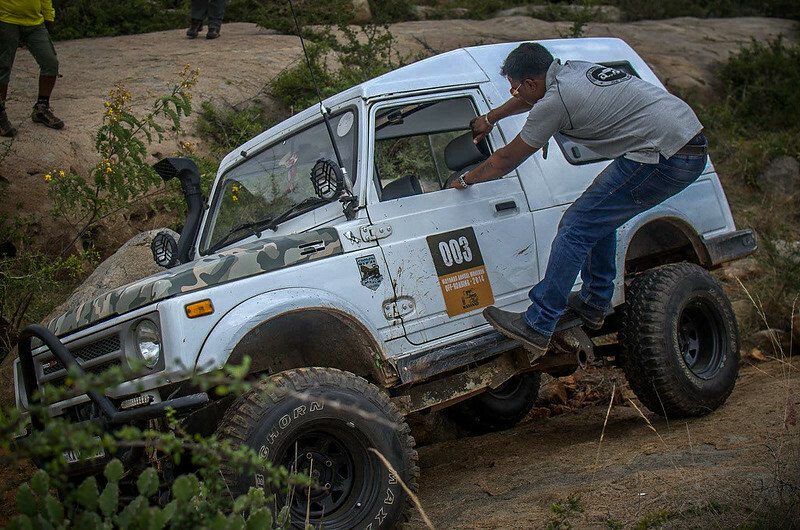 The longer wheel base Bolero Invader had a bit of a struggle to get up but he finally made it with a few attempts. I also needed a second attempt to make it since the initial line of approach wasn't proper and the jeep was skidding to the left instead of climbing up. 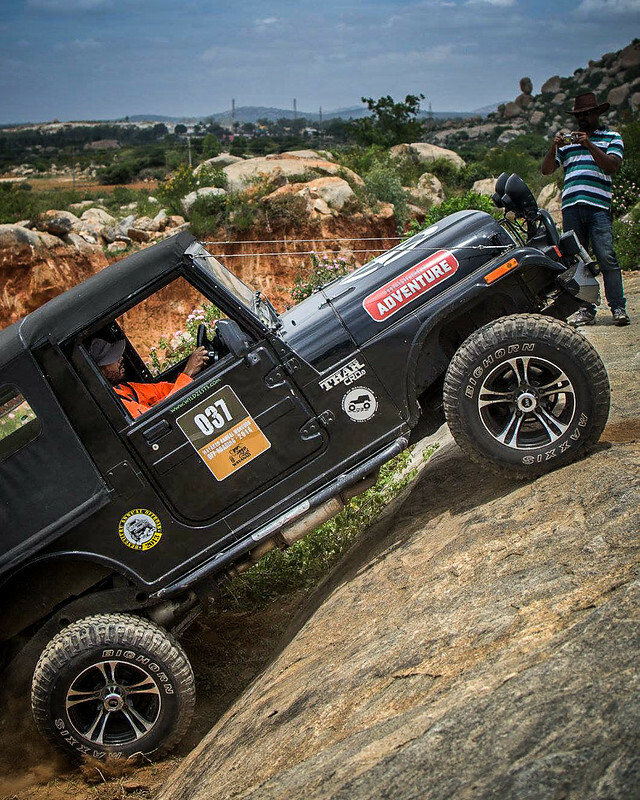 The next obstacle was even more tricky as it required careful negotiation through the rocky steps and then exit towards right with an awkwardly tilted jeep for about 10 meters. Underbody scrapes were unavoidable, but I just didn't want to hit anything too hard. Looking at everyone else's attempt, there wasn't a soul who came through without any clanking noises but thankfully there were no breakages. Again the gypsies made it out, but the lack of articulation makes them very vulnerable to a rollover. Add to that the fact that they have to always throttle their way out makes it even more scarier. But although it seemed dangerous, we didn't have any incidents. 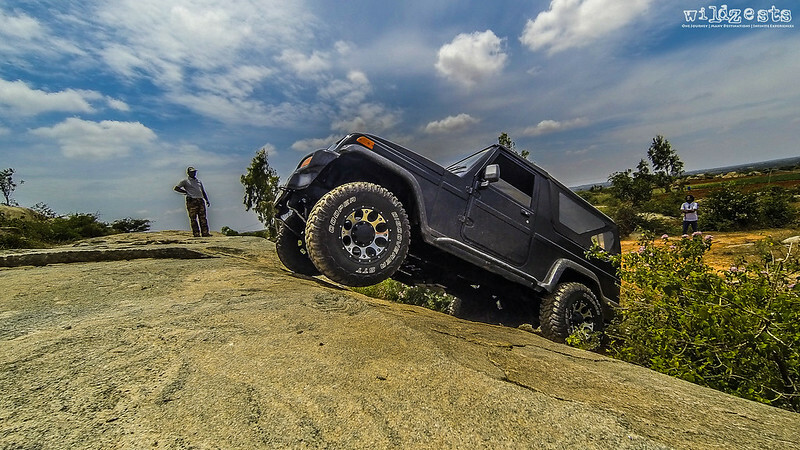 I had initially gotten my wheel stuck as I got down the first rocky step, but then with a little bit of cajoling and reversing I managed to squeeze the jeep out from the obstacle. There were surely some thuds that could be heard, but nothing serious. The right turn exit was quite tricky and most of the guys got an extra helping hand to shift the center of gravity and make it through. By the time everyone made it though this obstacle, it was already past 2PM and given that we had to stop for lunch before we get home, it was time for us to pack up. 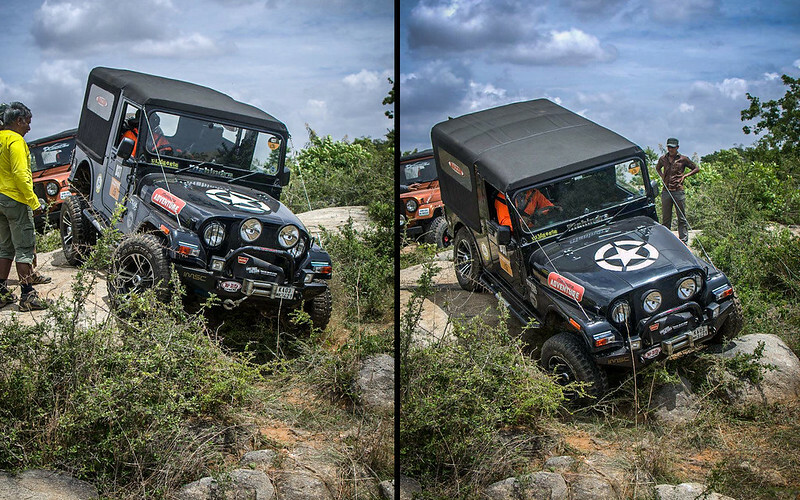 The JeepThrills team with Dwarak, Vivek and MP Sreenivas continued ahead for a little more I guess while we took leave and headed back home after a quick photoshoot. PS: Images that are not watermarked are sourced from the JoB and JT facebook group. Copyrights belong to their respective owners. Albert Einstein had said "The only source of knowledge is experience". I tend to agree with it completely, until you've gone through it, you don't "really" know what it's like. With the advent of technology and youtube, it's not too difficult to find a video or an article on what you were trying to do. There's enough crazy guys who must have tried something similar already and most likely video-taped it as well. But the touch and feel experience is something you'd not forget easily vs having a third person view. And this is exactly what happened in one of our lunch time conversations. Pozu and I were discussing some random stuff when the discussion went on to describing how clay pots are made. When I offered to take her to show her the pot making activity in person she was all excited about it. 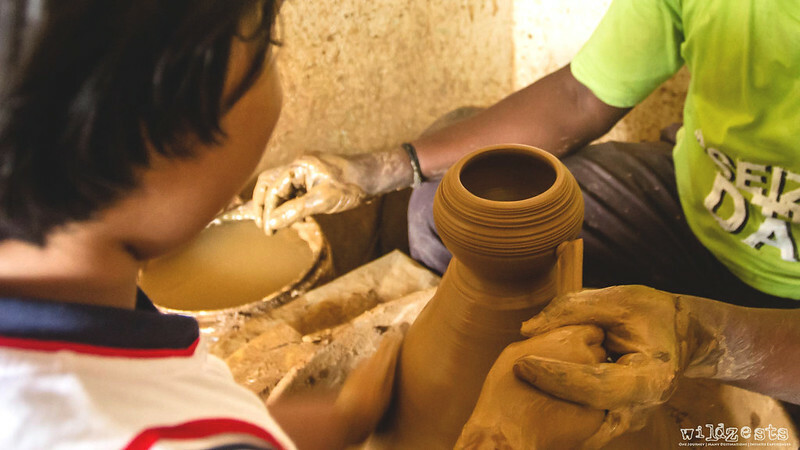 So we finalized a visit to the Pottery Town in Bangalore on the following weekend. All through the week she kept checking if we were on track with the plan, so there was no running away from it. That day she woke up and got ready pretty quick and soon we were in Pottery Town. Given that the Ganesh festival was round the corner, there were lots of stalls selling idols from a 1ft tall to a larger than life idol standing 15ft tall. 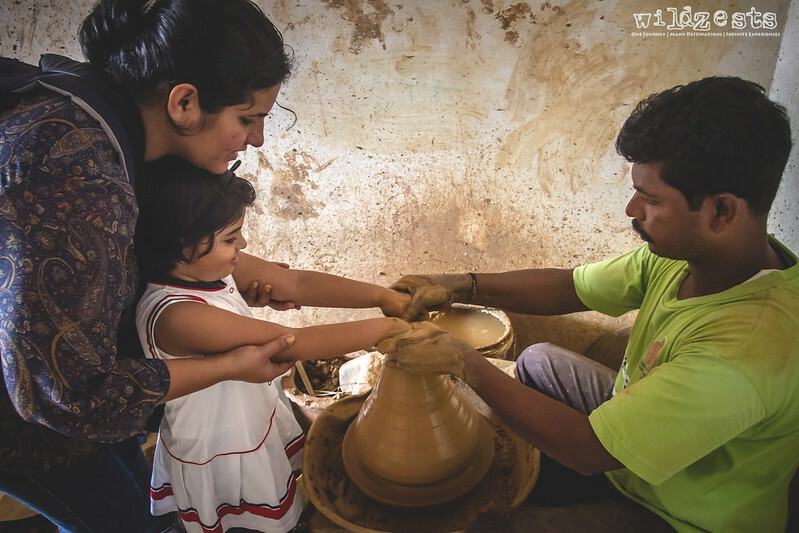 I had imagined the area to be abuzz with the artisans, but the traditional clay pot making houses are reduced to only a handful. Pozu was amused to see how one of the guys was kneading a large blob of clay with his feet - all she knew about clay until now was the colored Playdoh. On speaking with one of the fellows there, he told me that the large pot making guys weren't there for the weekend and I could come back on Monday if I wanted to see that. But there was one guy making small pots and the diyas upstairs. So we went up and met Ramesh who was a really kind-hearted gentleman. He first did a demo of how he makes the small pots and then invited Pozu to help him make a pot. Initially she was a bit apprehensive about it, but once she had laid her hands on the clay, she was all smiles. He even gifted her one of the pots as a souvenir with a nice handle on it. She now has plans to color it nicely as one of the weekend activities. A few days later, she surprised me with a question. "Daddy, what will happen if the Earth stopped spinning?" I didn't know how to respond to it so that she'd understand that the gravitational force would cease to exist and weather conditions would change drastically etc. But then she bowled me over by saying "If the Earth stopped, we'll all fall off". I asked her who taught her that and she said one of the boys from her school was telling them all this. And thus began our conversations about how the world is like a ball that goes around itself and the sun and how we experience night and day etc. Heck, she even understands the fact that US is almost diametrically opposite and that's how they're sleeping for the night when it's day here in India - makes me look like a fool sometimes. It was quite funny on how she is able to grasp all that concept so easily at her age. I'm sure that I wouldn't even have known how to wear my own clothes at the age of 4. She was eager to know more about how the moon changes shapes etc and soon we were talking about the solar system and the planets that in our galaxy. In 10 minutes she had registered the names of all the planets and could tell them in order of sequence. Soon, we were getting deeper and deeper into technicalities of the various colors of the planets, how they all go around the sun without hitting each other and how each of them has different number of moons etc. 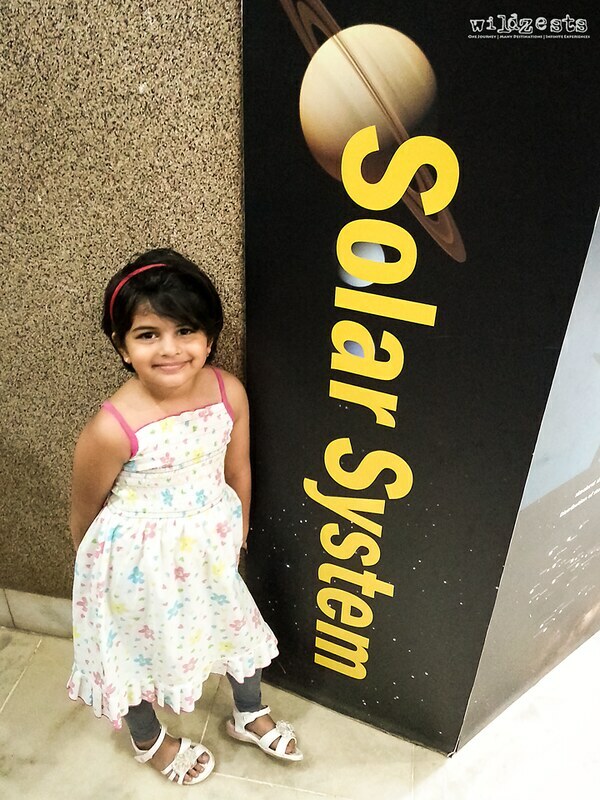 Looking at her level of curiousity, we took Pozu for a visit to the Nehru Planetarium. I knew it was going to be a little early for her age, but amazingly enough she enjoyed the documentary and could relate back to our conversations as she saw the planets and stars on the gigantic dome screen. Actually, she was quite amazed with the dome screen since she was expecting something like the cinema screens. I don't think she'll be able to retain all of this by the time she starts learning about it in her school, but given her learning capacity, I am really not concerned about all that just now. Overall, it was a wonderful experience not just for her but even for us - reinforcing some of the knowledge that takes a backseat with everything else that goes on in life.